God sees the poor as blessed. Rich and Reneé Stearns show us why. We often separate ourselves from people who are different from us, sometimes even intentionally. This book is a great reminder of all the things we share in common—hopes, dreams, heartaches—and most important of all, it reminds us that He walks among us. All of us. This book offers great perspective from our brothers and sisters around the world. Rich and Reneé Stearns have traveled the world visiting the most poverty-stricken habitations imaginable, and they’ve discovered an amazing and common occurrence among the people who live there: joy can be found no matter how dire your circumstances. 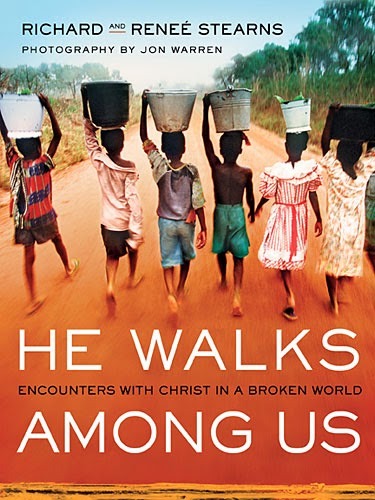 He Walks Among Us is a 90-day devotional giving readers an up-close and personal view of Christ in the lives of mothers, fathers, and children who have so little, yet are so rich in His spirit and love. Christians who are interested in or committed to missionary outreach will encounter the transforming power and courage needed to make a difference in someone else’s life. Spiritual lessons include: The Choice to Believe—No Matter What; Our True Identity Is in Christ; Discovering Joy in Unexpected Places; Having Unshakable Hope in the Power of God; Our Circumstances Don’t Define Who We Are; We Become Transformed When We Invest in Others; and Remaining Faithful to Your Calling No Matter the Obstacles. He Walks Among Us features the award-winning photography of World Vision® photographer Jon Warren. goes to our sponsor, Thomas Nelson! !